The Making Tracks funding scheme set out to increase the diversity of funded NZ music. 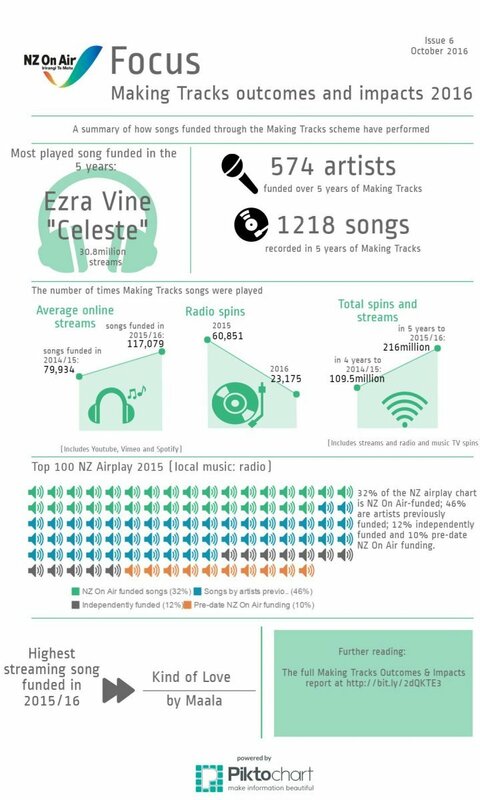 Over the past five years of the scheme a total 1,218 songs by 574 different NZ artists have received funding. The cumulative number of radio/TV plays and online streams topped 216 million over those five years (and is still climbing.) While radio spins from the songs funded in 2015-16 are low, the majority of songs funded in this year still haven’t been released at the time of this report. We will do another report on Making Tracks outcomes in 2017 to give a more complete picture. The report is in two parts. Part A reports on the broadcast ‘mileage’ achieved by Making Tracks-funded songs, on air and online, over the last five years. Part B reports on the artists we have funded and the impact of Making Tracks funded songs on the airplay charts.